Mate Precision Tooling, Anoka, MN, introduces EasyView tooling carts, which allow fabricators to stage CNC punch-press jobs ahead of time and locate the loaded carts near a press, ensuring timely setups. The carts hold a 2800-lb. load, keeping the tools protected and organized to reduce tool damage and eliminate wasted time as operators look for the correct tools. 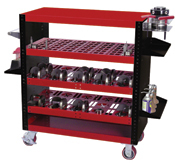 Modular in design, EasyView carts can be configured to a particular shop’s needs. Individual shelves are available for all of the tooling components in the Mate Ultra thick-turret product line, including A, B, C, D and E stations with pockets for punches, dies and strippers. A blank shelf is available as a workbench-setup area or for general storage; a side tray holds assembly tools, fasteners and lubricants. Four 700-lb.-capacity casters enable the carts to roll easily in and around machines and tight tool-storage areas. The carts are built from heavy-duty 14-gauge steel, powder-coated for durability. Choose one of two heights, 36 or 48 in., with red shelves and black side panels.